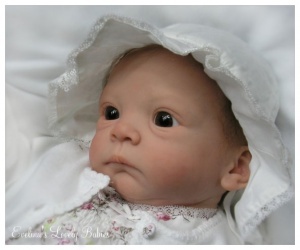 Baby Vivien will be around 51cm (20")in length with 3/4 vinyl limbs and is made from Real Effect® Soft Vinyl. Evelina spent more than two months working on this one-of-a-kind and it was worth every second. Baby Vivien is perfect in every detail and her wide, bright eyes and the sweetest little mouth simply took our breath away. We would, of course, also like to thank Evelina for her trust and faith in our ability to transfer her hard work and loving attention into vinyl. Her unique style has captured the hearts of collectors worldwide and her "One of a Kinds" fetch some of the best prices in the world. Evelina has thought long and hard about producing one of her babies in Vinyl. However, until now there hasn't been a moulding made to such a quality that has convinced her that her baby would retain its amazing detail.